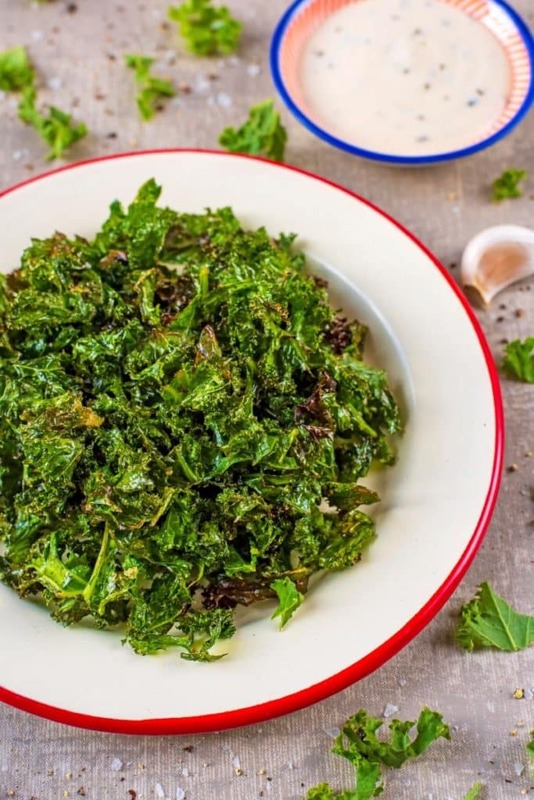 I know what you might be thinking – snacking on kale? Who does that? But just give it a try and you will be wowed by this crispy salty snack that is packed full of iron too. 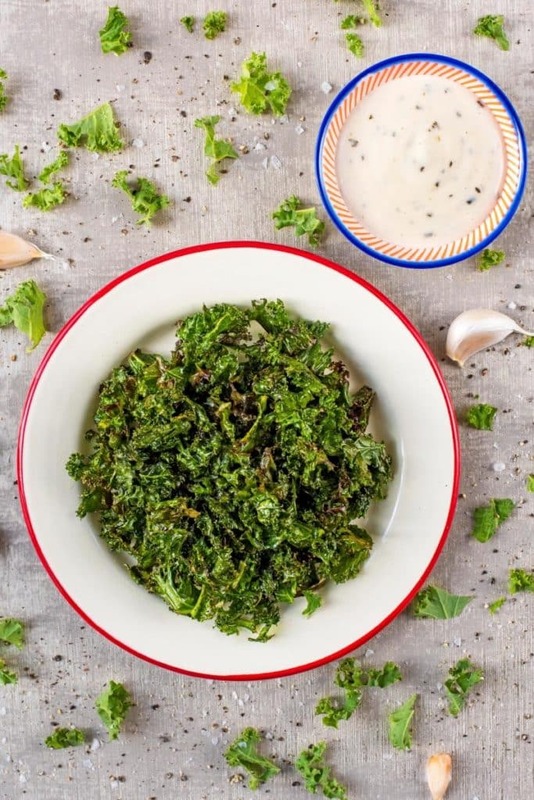 A great way to use up a bag of kale, and you can flavour it with so many different seasonings too. Your snack time is about to revolutionised. These really are a fool-proof savoury snack with a healthy edge. You just toss everything in a bowl and then throw it in the oven for 20 minutes until perfectly crispy. But there are a few things that you need to do to ensure these come out perfect. All the tips are in the recipe, so make sure to check them out. Let me start off by saying that Dave hates kale. I put it in stews, curries, soups and he picks it out. He just isn’t a fan of the texture. But when these came out of the oven he was intrigued, because it had become crispy and they smelled salty. He grabbed and handful and ate them and quickly declared “you have even managed to get me to like kale”. WIN! We used just standard green kale to make these, but if you can find some purple kale too, then use a mixture as it gives is a nice mixture of colour. 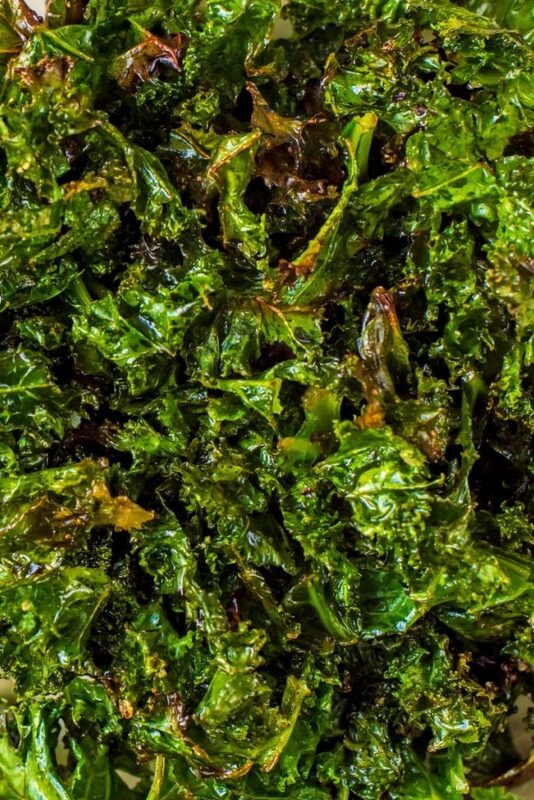 When kale is roasted, it totally changed the texture and it becomes wonderfully crispy. You have to be careful not to cook it too high or for too long otherwise it will burn. But this crispy iron packed snack is a great alternative to crisps when you want something salty. They are best eaten straight out of the oven (when they have cooled for a minute or two), as they will be at their crispy best. But I don’t think that will be too much of a problem, as these barely last 5 minutes when I make them. What About Kale Chips Seasoning? We try to make as many of our recipes adaptable as we can, because everyone has different tastes. The basic recipe for this is really simple, so it leaves it open for you to get creative and add your own flavours. Like your snacks spicy? Add some cayenne pepper for a fajita/cajun seasoning. You could keep it simple with some oregano and a little bit or parmesan, or if you are a fan of salt and vinegar crisps then you could toss these in a little malt vinegar just before serving. 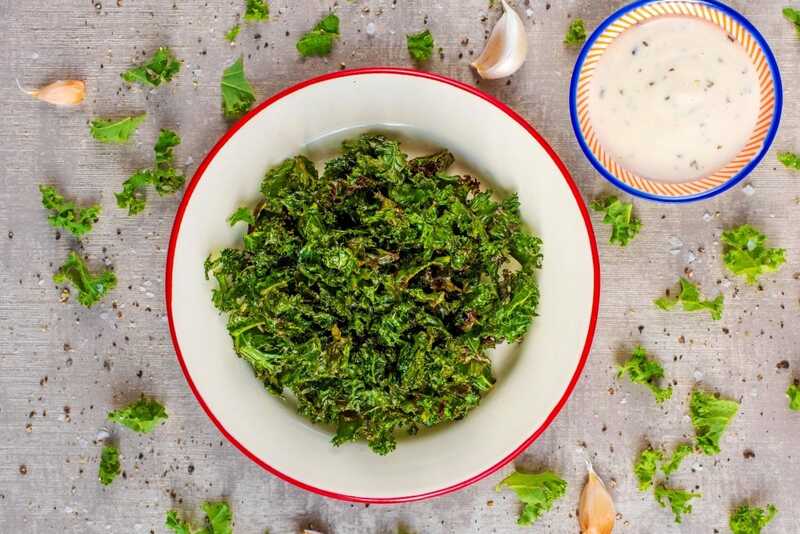 One: Put the kale in to a large bowl and add the oil and salt (and any other seasoning you are using). Mix well. Two: Spread out on a baking tray and put in a preheated oven at 160C for 20 minutes, until crispy. Don’t forget to remove the kale stalks, as they won’t get crispy. Don’t be tempted to use too much oil, as it makes them go soggy. 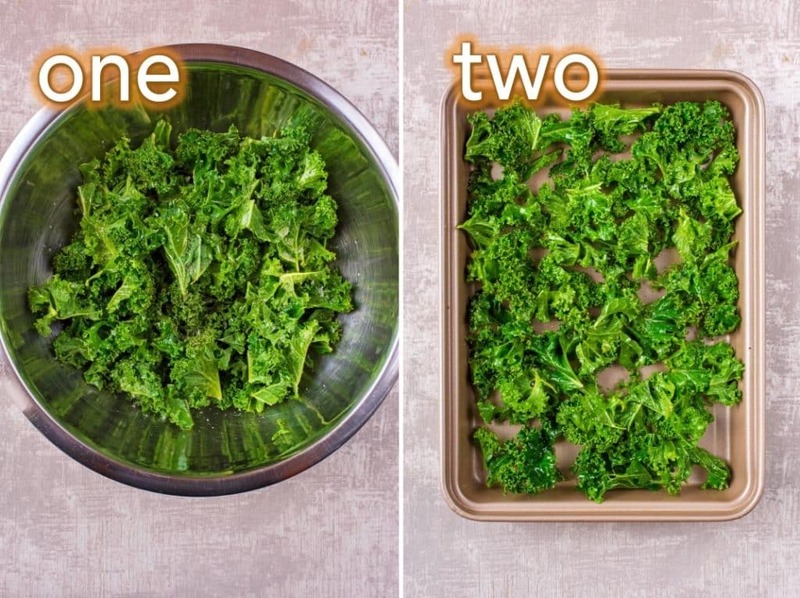 Spread the kale in a single layer on a baking sheet. If they are all piled on top of each other they won’t cook evenly or get very crispy. 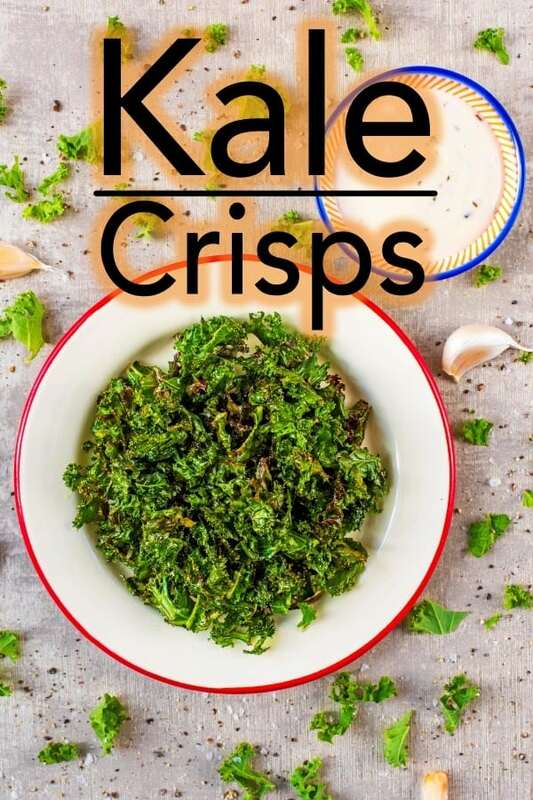 If you’ve tried these Kale Crisps, or any other recipe on the blog, then let us know how you got on in the comments below, we love hearing from you! You can also FOLLOW US on FACEBOOK, TWITTER, INSTAGRAM and PINTEREST to see more delicious recipe ideas, behind the scenes shots and also what we are getting up to. I really like the idea of making a very healthy snack wtih very simple ingredients. My first impression of this recipe was to be honest not enthusiastic. 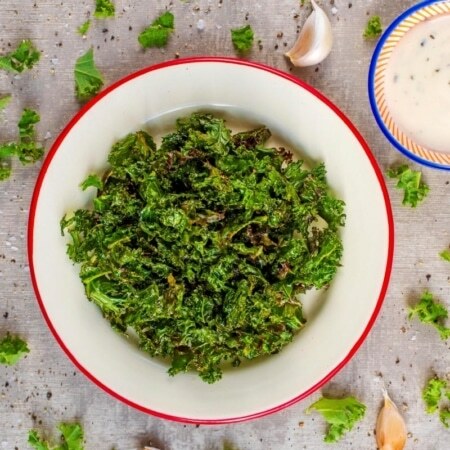 Making crisps of kale, who does that? I’m also not such a fan of vegetable chips because they don’t taste of anything. But when I was reading this recipe, my opinion changed. It all sounded so tasty that I felt like trying it for myself. Like I said, I really like the idea and I’m surely going to try it by myself. GREAT recipe. Totally fulfilled my crunchy snack craving while being super healthy! So simple!! Why have I not thought of this?? Amazing! I tried last night instead of snacking on cracker it was perfect! Love this super healthy alternative for my snacks! Another good way to use the oven. Thanks for sharing! I was hesitant to try roasted kale the first time I did but roasting really does transform the flavor and of course there is no guilt eating these chips. Delish! Now this is a great healthy snack! Will be trying it soon!